This is a very important task. Gather up your birth certificate, copy of your driver’s license, passport, titles of cars, insurance papers and cards, marriage license, ketubah, burial plot records, medical records, family death certificates, bank accounts together with the name, phone number, email address of your lawyers, accountants, doctors, etc. Preferably you will put these items in a waterproof tote and have this ready to take with you personally when you move. These papers are too important to pack in a box. If possible, have this information scanned into your computer, saved in a cloud for safe keeping. A good rule of thumb is to pack heavier items in smaller size boxes. I recommend Home Depot heavy duty boxes. You can order your supplies on line and have them delivered to you. Always ask for inside delivery as supplies can be too heavy to carry in from the outside. Order newspaper print without the ink. This can be purchased at Amazon. When ordering bubble wrap, choose the smaller size bubble when wrapping most items. The larger bubble is good for cushioning the bottom of a box. Permanent markers help mark boxes with numbers and box contents. When you buy packing tape, don’t go cheap. Buy the 3M/ Scotch products. The heavy-duty tape will stick best and won’t rip during use. Don’t forget to buy different bag colors to help you recognize garbage from donations. If you are also distributing items to family/friends, then use a third color bag. We often use black, clear and blue 3 mil bags. The more effort you put into packing will help you expedite the unpacking. Keep a notebook handy as you pack and make a list of every item you place in the box. Mark down the box number, both on the box and in the notebook to help create an accurate spreadsheet. When all the boxes are complete, create three spreadsheets. One spreadsheet should have the list of boxes and their contents. Spreadsheet two should have all the contents in alphabetical order and showing the box they can be found in. The third spreadsheet tells you the room the contents came from and in which room the moving company should place the box. Make sure the boxes are clearly labeled with where it is to be left in your new home. There are preprinted color labels to place on the outside of boxes for easy recognition. 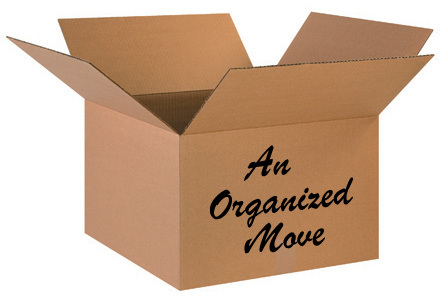 When packing, pack everything next to one another, not allowing for space gaps. The goal is not to let any item have room to move around in a box. When possible use three pieces of the non-print newspaper to wrap the item and if its’ fragile, we recommend placing bubble wrap around the paper. Cushion the bottom of the box with crushed paper, large bubble wrap or newspaper. We don’t like using newspaper as the ink gets on your hands and that can get on your items. Many people use it because it’s the least expensive paper. Cushion where there are gaps or fill in with paper. When packing dishes, make sure you are packing them on their spine, not flat. This creates less pressure on the plate. If you would like to see how professionals pack, look it up on you tube. You will be pleasantly surprised by the tips you pick up. No, this isn’t rocket science, but there are smarter ways to pack to assure your items don’t break.